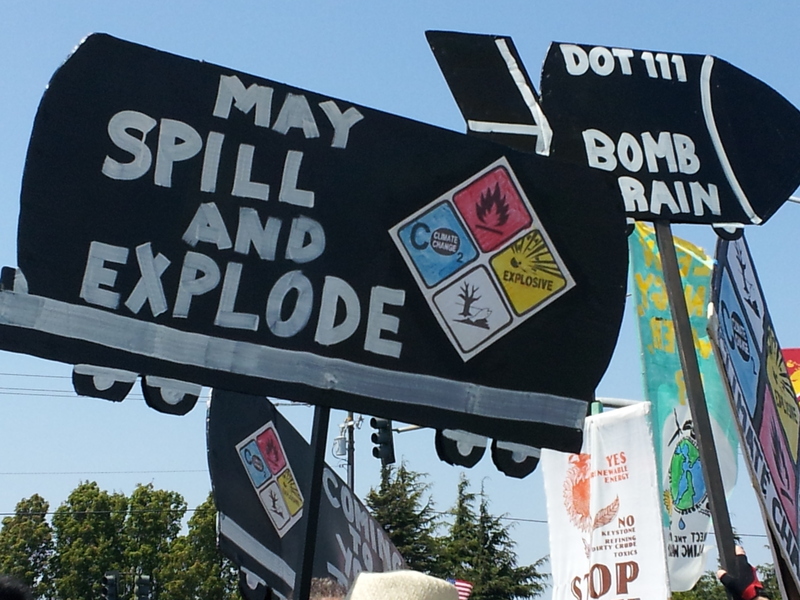 About 75 people gathered at the Kinder Morgan rail yard in Richmond, CA to protest the transfer of explosive Bakken crude oil from train to tanker truck. The product is unloaded in Richmond then trucked on Highway 4 to the Tesoro Refinery in Martinez, putting thousands of residents at risk along the way. A lawsuit was filed against the Bay Area Air Quality Management District for approving the transport of this type of crude without an Environmental Impact Report or any sort of public hearing. Speaking out against this dangerous practice were representatives from Idle No More, West County Toxics Coalition, 350.org, GreenAction, Communities for a Better Environment, Richmond Progressive Alliance, Sunflower Alliance, Global Community Monitor, and our very own Martinez Environmental Group, as well as author and oil industry expert Antonia Juhasz.